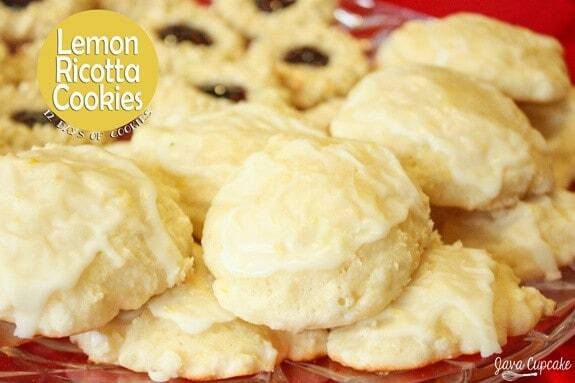 Celebrate the holiday season with all your friends and family with these delicious gluten-free Spritz cookies! No one in my family needs to eat gluten-free, so I don’t typically buy the ingredients necessary to bake that way. Recently, my good friend Rachel of the blog Glitter & Bow decided to change her diet and eat according to her blood-type. One of the changes she implemented was cutting out gluten. 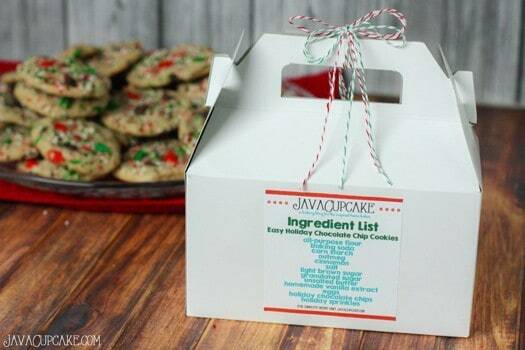 This made things (selfishly) hard for me this Christmas because I love giving the gift of baked yummies as gifts. I gifted her a loaf of gingerbread, but sadly she couldn’t enjoy any of it. Her husband however did, so it didn’t go to waste. I knew I needed to bake my friend something she could eat and enjoy! Spritz cookies have very few ingredients, so I thought they’d be perfect to try out as gluten-free. My friend Deb had given me a bag of Cup 4 Cup gluten-free flour a while back and I had yet to bake with it, so I thought this was the perfect time to do so. These cookies cake out almost perfect! I had to adjust the baking time down after the first batch in the oven because they bake very quickly. I also think next time, I’ll double the amount of almond extract I use. I love a spritz cookie that packs a huge flavor punch. But don’t let that deter you from making these spritz, they were so delish! I could barely tell the difference in texture and flavor! “Our founder, Chef Lena Kwak, developed Cup4Cup while serving as Research and Development Chef in the kitchen of the famed French Laundry in Yountville, CA. She and her mentor, Chef and Owner Thomas Keller, knew they had stumbled upon something special when a guest tasted Lena’s gluten-free brioche and cried with joy because she hadn’t tasted bread in seven years. They knew this was a product that had to be shared. You can also connect with Cup4Cup on Facebook, Instagram and Twitter! So, since the almond flour did not work at all in this cookie recipe, I think I’ll just stick to using Cup4Cup in the future! It’s an amazing alternative to all-purpose flour for our gluten-free friends and family! 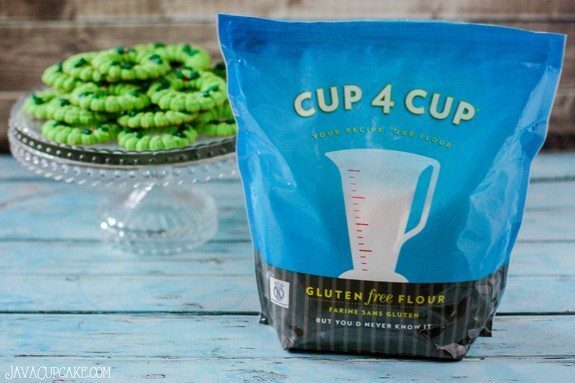 And to get you excited for gluten-free baking, Cup4Cup is giving away 2 of their amazing products to one JavaCupcake reader! To enter, simply fill out the information below! Giveaway open to those with USA mailing addresses only. Winner will be chosen Jan. 30, 2014. In the bowl of a stand mixer with the paddle attachment, cream together the butter and sugar. Add the egg yolk, cream and extract and mix until combined. Scrape the sides of the bowl. Slowly add the gluten-free flour and mix until completely incorporated. Add 2-4tsp more flour until the dough no longer sticks to the paddle attachment. 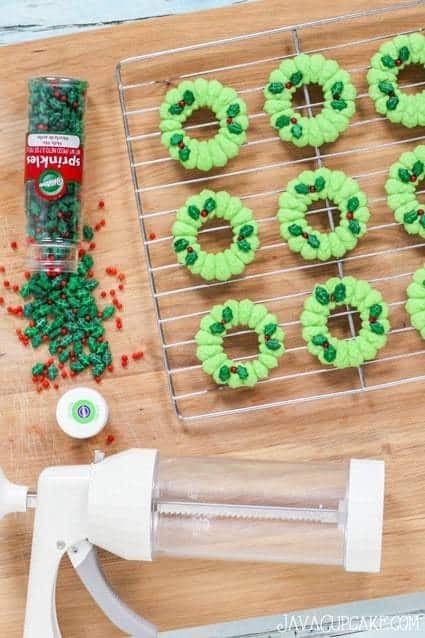 Fill the cookie press fitted with the wreath cut out with the dough and chill for 10 minutes in the freezer. Press the dough onto a baking sheet. 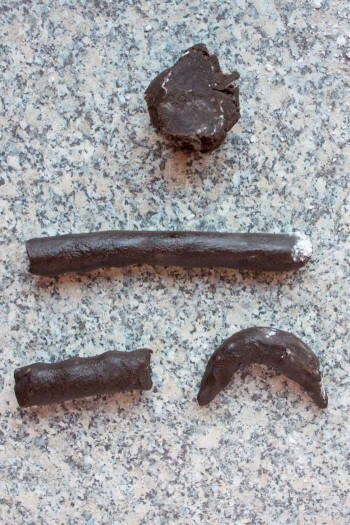 Do not line or grease the baking sheet - the cookies will not stick to it if you do. Place the holly leaves and red balls on the each wreath. Bake for 4 minutes or until the bottom begins to brown. Cool on the baking sheet for a minimum of 5 minutes before removing carefully to a wire rack to cool completely. Measure all ingredients carefully and by weight. This will ensure the proper consistency of the dough to make the perfect spritz cookie. 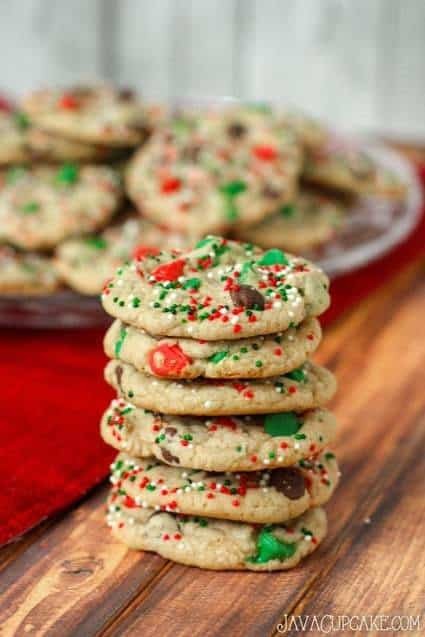 If the dough is sticking to the cookie press, try these tips..
-Add a teaspoon of flour at a time and mix into the dough until the dough no longer sticks to the beater. -Chill the dough until firm. -Do not line the baking sheet with any paper or grease. The dough needs the surface of the baking sheet to stick to. 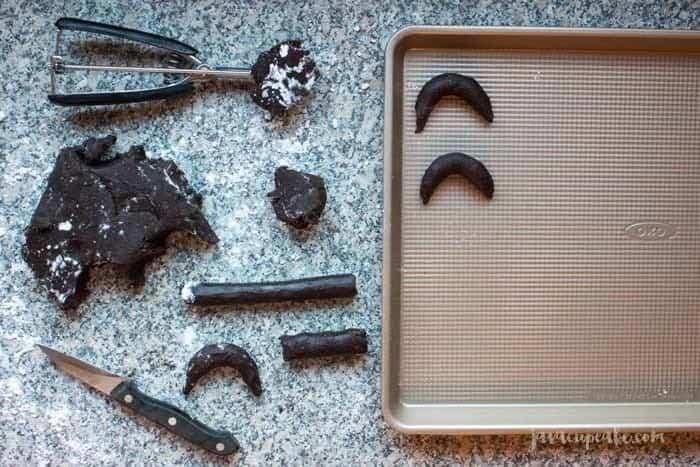 Make sure to allow the cookies to almost cool completely on the baking sheet before removing them. The gluten-free flour is very fragile and the cookies will break if you try to move them too quickly. 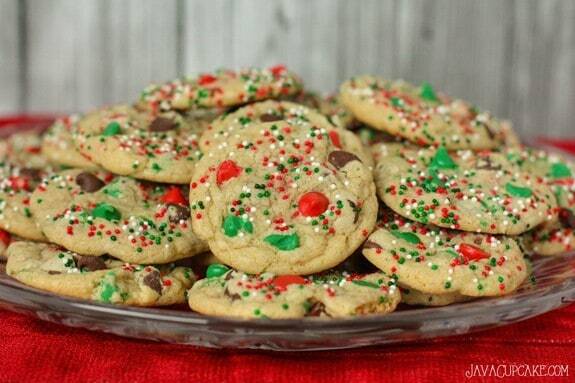 Kick things up a notch for the holidays by baking these Easy Holiday Chocolate Chip Cookies! 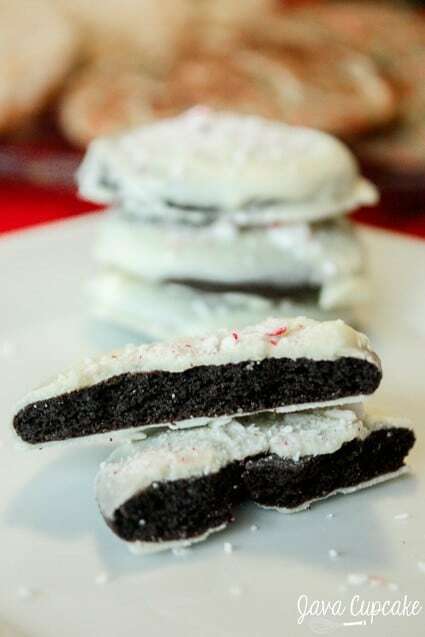 A festive twist on a classic cookie perfect for your Christmas cookie plate! I’m super excited to be participating in The Great Food Blogger Cookie Swap for the fourth year in a row! Check out 2013’s Apple Snickerdoodles, 2012’s Candy Cane Crinkle Blossoms and 2011’s Grinch Cookies! This year I’ve taken my favorite chocolate chip cookie recipe and gave it a special holiday twist! I added a few spices like cinnamon and nutmeg and decorated them in festive red and green colors! A touch of sprinkles on the top brings it all together! 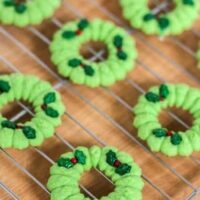 Sometimes, it feels as though Christmas cookies need to be super fancy and creative in order to be made during the holidays. Not true! I love these chocolate chip cookies any time of the year because they’re simply perfect! The 4rd Annual Great Food Blogger Cookie Swap, hosted by Lindsay of Love & Olive Oil and Julie of The Little Kitchen brings together food bloggers from around the world in celebration of all things cookie. Last year we had over 620 bloggers participate and raised over $14,000 for Cookies for Kids’ Cancer. That’s a lot of cookies doing a lot of good! 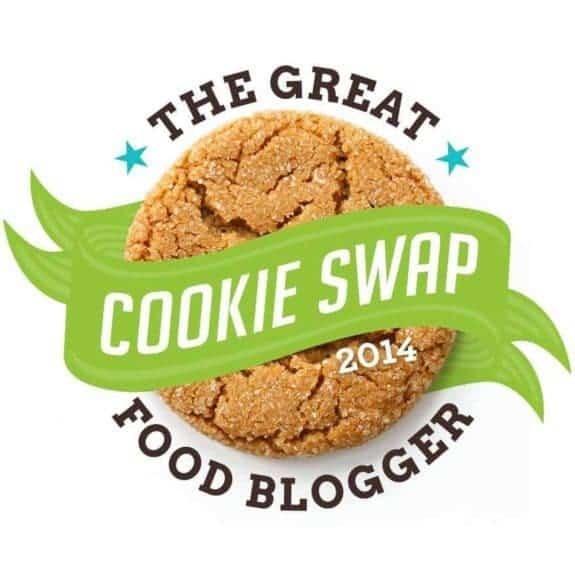 For more info or if you want to participate next year, visit The Great Food Blogger Cookie Swap‘s website! 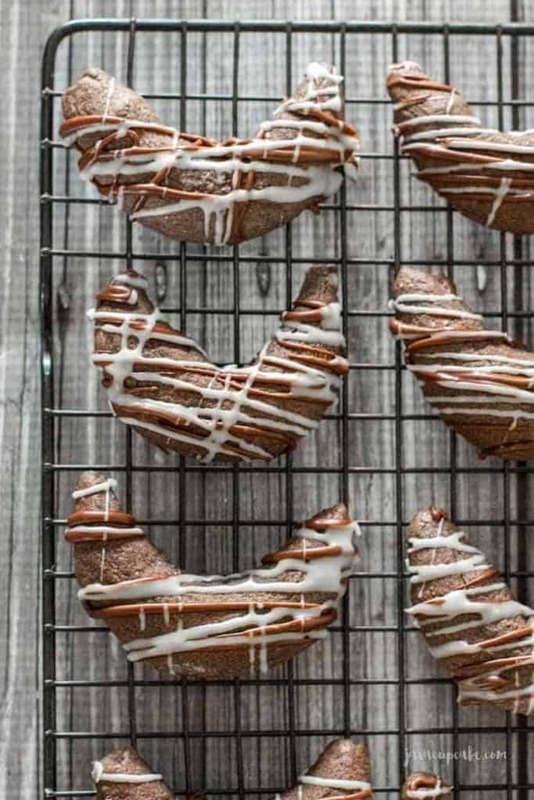 This year my Easy Holiday Chocolate Chip Cookies went to The Chocolate Cult, Sweet Potato Bites and NY FoodGasm! I hope they enjoyed these cookies as much as I did! Since it’s a swap, I also got cookies too! I received Brown Butter Chocolate Chip Cookies with Sea Salt from Sophia at NY FoodGasm (which were my FAVORITE – I didn’t share these at all with my family!). And I got Salted Chocolate & Caramel Shortbread Cookies which my husband immediately stole and took to work to share with his soldiers from Heather at Majorly Delicious! Finally, were Oatmeal Lace Cookies from Marjory at The Dinner Mom – delicate and delicious! They were all so yum! I can’t wait until next years swap! In a large bowl, whisk together the flour, baking soda, corn starch, salt, nutmeg, and cinnamon. In a medium bowl, whisk together the sugars until no more clumps remain. Add the melted butter and vanilla and whisk until smooth. One at a time, whisk in the eggs and continue to whisk until completely incorporated. Pour the wet mixture into the dry mixture and whisk/blend until smooth and no clumps remain. The dough will be thick and sticky. Add the holiday chocolate chips and fold until evenly distributed. Cover with plastic wrap and freeze for 2-3 hours or until the dough is firm. Alternately, you can chill the dough in the fridge overnight. Once the dough is cold, preheat your oven to 350F degrees and line two baking sheets with parchment paper. Roll a 1in ball of dough in your hand and flatten slightly. Press the top of the ball into the nonpareils until lightly covered. You don't want too many sprinkles on top, so brush off any extra. Place the dough on the prepared baking sheet. Bake each tray for about 12 minutes or until the edges are lightly golden. Do not overbake! 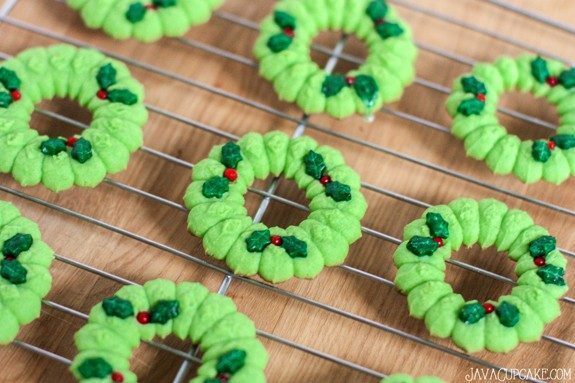 The cookies will puff up during baking but will collapse while cooling. Allow the cookies to cool on the baking sheet for 2 minutes before removing to a wire rack to cool completely. 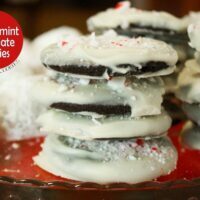 Crisp chocolate & peppermint cookies covered in smooth white chocolate and topped with peppermint candy make these Peppermint Chocolate Cookies the perfect Christmas treat! We’ve finally made it to the end of 12 Days of Cookies! It’s been such a fun month sharing with you some of my favorite Christmas and holiday cookies that I’m almost sad to see it end! Ha! Just kidding. Making 12 types cookies all at once was hard and very time consuming! But, the pay off was oh-so-delicious! And I was able to share holiday boxes filled to the brim with these cookies with Emily’s teachers and office staff at her school. They, of course, loved it and ranted and raved over how delicious they all were! It’s quite something to see a box with a dozen different kinds of cookies and know that one person made them! This final day of cookies brings you one cookie with two classic holiday flavors. Chocolate & peppermint. You really can’t go wrong with this combination. 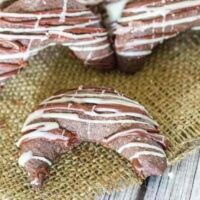 The cookie is a crisp and crunchy dark chocolate & peppermint cookie that’s similar to cookie part of a Girl Scout Thin Mint cookie. 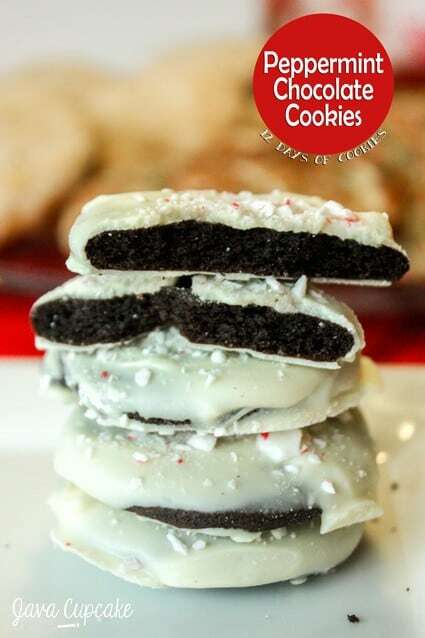 It’s then covered in creamy white chocolate and garnished with crushed peppermint candy. 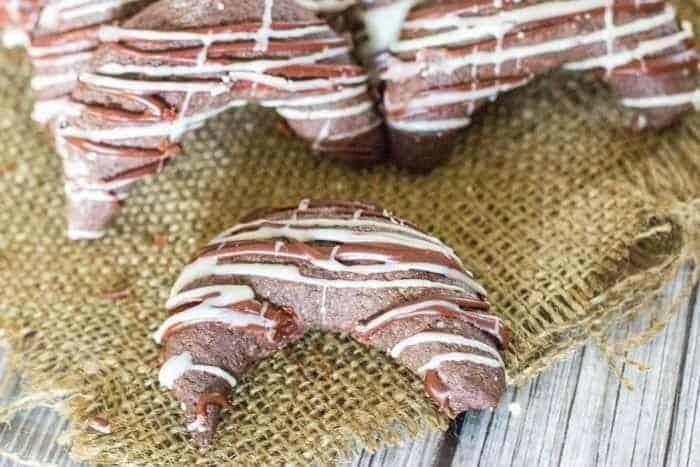 These delicious Peppermint Chocolate Cookies will surely please the kids and grown-ups in your family! Although my cookies are hardly”perfect” looking – I quite like the messiness of them. I think it makes them look homemade, real and like I really put heart into making them. I think they’re perfect! 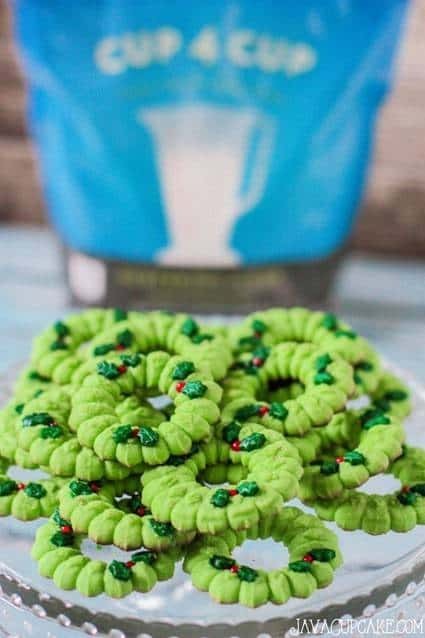 If you’ve missed out on any of the cookies in the 12 Days of Cookies, make sure to check out the main page where you can see photos and links to all the cookies! If you have made any of these cookies, I’d really love to see them! Post a picture on my Facebook wall or send me an email! It really warms my heart knowing that my recipes have added some joy to you and your family this holiday season! So… from my family to yours, I’d like to wish you all a very Merry Christmas and Happy Holidays! Preheat oven to 325 F degrees. Line baking sheet with parchment paper. In the bowl of your stand mixer, cream together the butter and sugar on high for 1-2 minutes. Add egg and egg yolk and mix until well incorporated. Scrape the sides and bottom of the bowl. Beat in the peppermint extract. In two parts, add the flour mixture and mix on medium speed until just incorporated. With your hands, form the dough into a large disc and cut in half. Wrap each half in plastic wrap and freeze for 1 hour or refrigerate for 4 hours. Onto a floured surface, roll out the dough to 1/8" thickness. 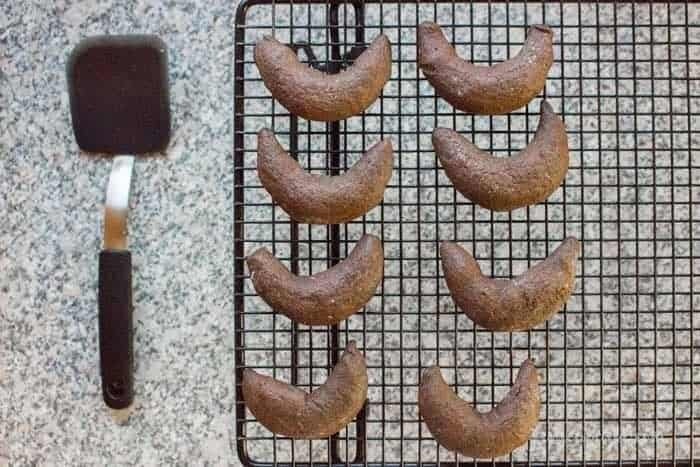 Using a 2" round cookie cutter, cut out discs of dough. Place the cut dough onto the cookie sheet and freeze until firm - about 10-15 minutes. Bake for 11-13 minutes or until the cookies are dry to the touch and are not soft in the center. Remove to a wire rack to cool completely. In a double broiler, melt the white chocolate until smooth. Dunk cooled cookies in the melted white chocolate until completely covered. Tap off the excess chocolate and scrape off the excess chocolate from the bottom of each cookie. Place them on the prepared baking sheet. 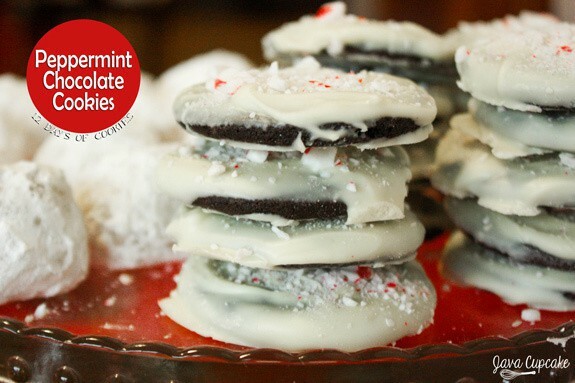 Sprinkle the top of the chocolate covered cookies with crushed peppermint candies. Refrigerate until set. Store in an air tight container for up to 2 weeks. 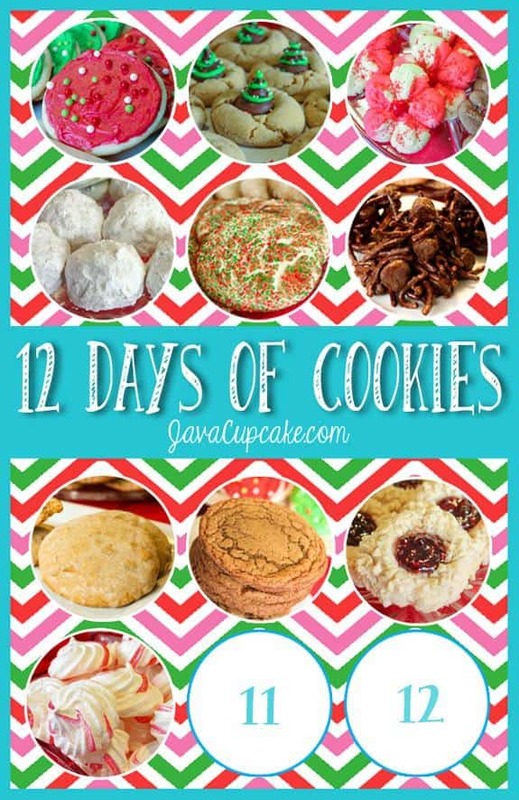 Check out the main page for the 12 Days of Cookies and you’ll find the links to all the recipes! Cake-like cookies made with fresh lemon and ricotta then topped with a tart lemon glaze make these Lemon Ricotta Cookies an irresistible holiday treat! I can’t take credit for this recipe. 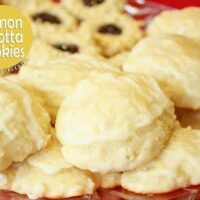 In fact, I had never heard of Lemon Ricotta Cookies before I made them this holiday season. 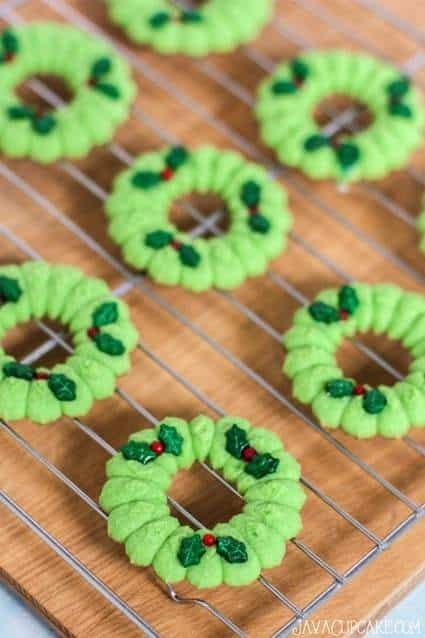 When preparing for this series, I asked several of my friends what their favorite family Christmas cookies were and these were the only ones I’d never heard of before! The recipe comes from my friend Sarah. Miss Sarah as my daughter calls her. Our husband’s work together and are both deployed to Afghanistan with 2nd Cavalry Regiment right now. It’s comforting to have a friend whose husband is doing the exact same thing mine is… it’s like having someone who can understand exactly what you’re feeling about a subject that very few people know anything about. That’s a quality to find in a friend when you’re the spouse of a soldier. This picture was taken shortly after our husband’s left for Afghanistan. 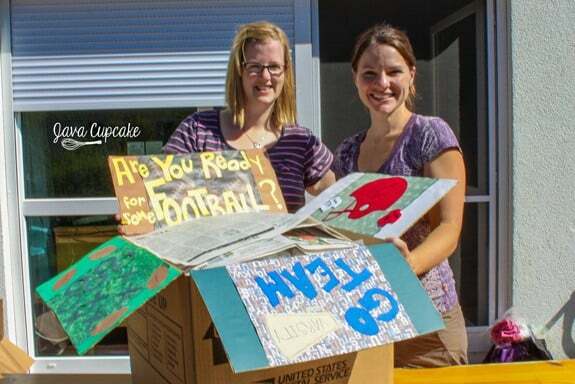 Sarah and I got together with a couple other ladies to put together a big football themed care package for our husbands and the rest of their platoon. Usually when Sarah and I get together it’s for coffee and for our kids to play… she’s got two little ladies who like to come over and play with my little Matty. Kids get to play, Mommies get to relax and chat. Win win. If I can recall what Sarah told me… the recipe for these Lemon Ricotta Cookies came from her Grandmother. Sarah let me borrow the recipe card with the hand written ingredients and directions and I took great pride in keeping her family heirloom safe and sound while I made these cookies. These cookies are very soft and almost like little pillows of cake. Pillows of cake covered in sweet yet tart lemon icing. 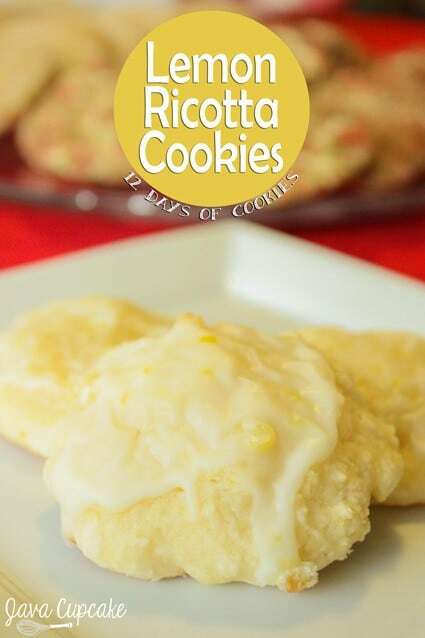 They are packed full of fresh lemon flavor and the ricotta really adds a richness that compliments the cookie perfectly. For such a simple looking cookie, this recipe really packs a punch when it comes to flavor. Out of all the cookies I made this season, these lemon ricotta cookies I think are going to be one I make every year. A real winner. Thanks to Sarah for sharing this recipe with me! I’m really honored to be able to share this recipe with my readers! Preheat oven to 375 F degrees. Line cookie sheets with parchment paper. In the bowl of your stand mixer, add the sugar and lemon zest and mix until the oils of the zest have incorporated with the sugar - about 1 minute. Add the butter and cream for 2 minutes. Mix in the eggs, one at a time, scraping the sides of the bowl after each addition. Add the ricotta and lemon juice. Mix until just combined, you want to see a few chunks of ricotta in the batter. Fold in the flour and stir by hand until incorporated. Drop 2 Tbsp of dough onto the prepared cookie sheet. 12 drops of dough should fit on the sheet. Bake for 11-13 minutes or until the edges begin to brown. DO NOT OVER BAKE. Leave on the cookie sheet for about 2 minutes before removing to a wire rack to cool completely before glazing. In a small bowl, whisk together the powdered sugar, half the lemon juice and zest until smooth. If the glaze is thick enough to spread at this point, do not add any more juice or the water. If it's too thick add more juice until it's a consistency you like. After the juice is gone, add water until you reach your desired consistency. Adding too much water/lemon will make the gaze too runny, so start with a small amount. Spoon 1/2 tsp of glaze on the top of each cookie and use the back of a spoon to gently spread over the cookie. Let set for 2 hours before serving. 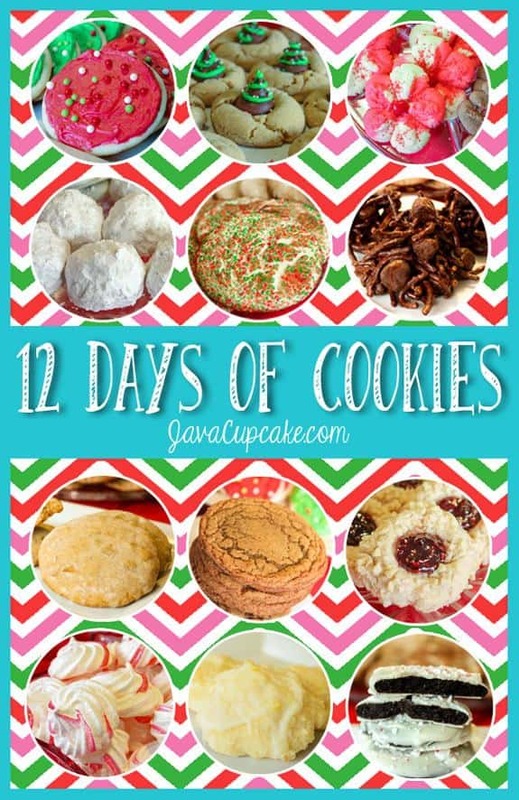 Check out the main page for the 12 Days of Cookies and you’ll find the links to all the recipes! Next cookie will be posted tomorrow! 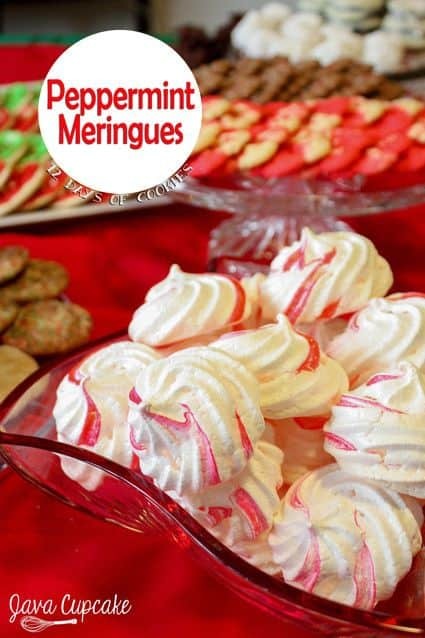 Light and airy, these peppermint meringues are are soft with a crisp texture and are a delightful, delicate treat for the Holidays. This was the first time I’ve ever made meringue cookies, and although they weren’t perfect…. they were super delicious! Pillows of peppermint that melted in my mouth with each bite. So yum! I did learn a few things while making these… the biggest lesson being that I should NOT rush the process of making these meringues. Although there are few ingredients, if you don’t take care to follow the process, they won’t turn out perfectly and will either crack on the outside or collapse in the center. These were pretty on my table with all my other cookies, but I don’t know if I’d make them again. If we’re being completely honest. They were a new experiment, but I was the only one who liked them. Oh well! I know there are LOTS of other people who do love them! The recipe I used comes from my friend Amanda at i am baker. 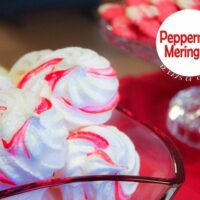 I know there are dozens of versions of meringues available on the internet, but I wanted to a recipe that I knew I could count on. That’s why I chose to use Amanda’s. 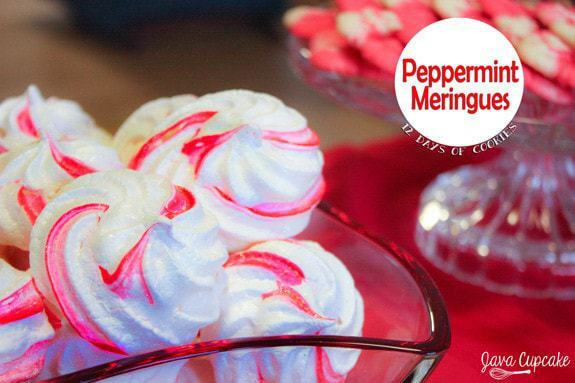 To spice things up for the holiday season, I flavored these meringues with peppermint extract and added a pretty red swirl! So festive, don’t ya think ? Preheat oven to 225 F degrees. Line 2 baking sheets with parchment paper. Fit a piping bag with an open star tip and line creases with red gel food coloring about 2 inches from the tip up. In the bowl of your stand mixer, beat the egg whites on medium speed until frothy. Once frothy, add the cream of tartar and beat until soft peaks form on medium speed. Increase speed to medium-high and add the sugar 1 Tbsp at a time until gone. Continue to beat until stiff peaks form. Add the peppermint extract and beat until combined. Gently scoop meringue into prepared piping bag. Slowly squeeze the bag over the bowl until the meringue comes out with the red line showing. Pipe a swirly dollop of meringue onto the prepared baking sheet. Bake for 45 minutes. DO NOT OPEN THE OVEN WHILE BAKING and COOLING! After the 45 minutes, turn the oven off. Let the meringues cool completely in the oven - at least 1 hour. 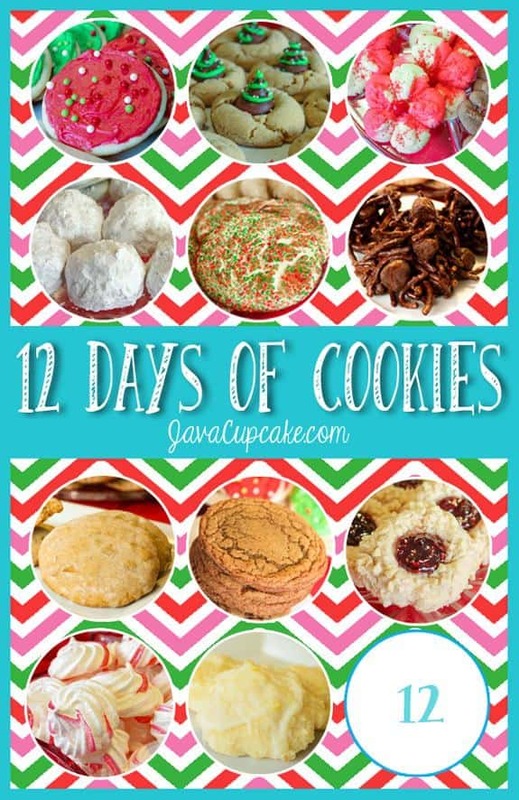 Check out the main page for the 12 Days of Cookies and you’ll find the links to all the recipes! Next cookie will be posted Monday!